Day 5 of weight loss fasting was very difficult. From fasting experience I realize that it is at this point that the mind accelerates its argumentative attacks to convince me to end my efforts. The body also starts to yell out with greater force as the diet detox fasting process escalates. 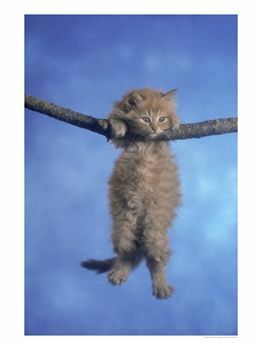 I am hanging by a thread just like the cat in the photo! The morning has gone by with fair ease, although my stomach continues to groan and complain. It is indeed like a small child that is angry because it is not getting what it wants. I must realize during weight loss fasting that I have allowed my stomach to run my life up to now with very detrimental results. To read the previous entry, go to Day 4 of Fasting for Quick Weight Loss. Yet today I am convinced. The time is now for me to exert the discipline required to regain control of my life before I become more severely obese and possibly sick beyond recall. The benefits of going through this weight loss fasting sacrifice certainly outnumber the grumblings of the stomach. This is possibly the most important move I have ever done in my life. I expect to gain clarity of mind, health and energy from this. I must say that the hunger pains have become notably stronger than in any of the previous days. And, again, here I am surrounded by cookies, chips and great-looking deli sandwiches. I ate a pear and made a cup of Green Tea. Note: Green tea has truly worked wonders for me. It gives me energy, reduces the hunger pains and has allowed me to continue. But those sandwiches and cookies still look great!! I have to take this weight loss fasting One moment, one second at a time. I also have been feeling a sudden burst of emotional insecurity - a sense of not being "good enough." This weight loss fasting feeling has really come out of nowhere. I suspect this emotion is one that I often cover up with overeating. It is definitely a core issue within myself. Binging acts as "comfort" and helps me to suppress insecurity and low self-esteem. Fear of the future, doubt and unbelief. That is why, for me, food had truly become a drug. Weight loss fasting brings it out into the open. There is a guy nearby eating a bag of potato chips. The crunching sound is like nails in a chalkboard. Then, to my horror, there is a lady to the other side working on a bagel with cream cheese. Plastic knife in right hand, she digs into the little round cream cheese recipient, moves it over to the bagel on her left hand and glides the knife back and forth - covering it all around. It is almost hypnotic. And the crunching continues from the chip-eating fella. Right about now, I want to pull my hair out. Breathe! breathe! breathe! Made it through lunch by the skin of my teeth. Someone brought in a pizza - a definite favorite. My mouth was watering and I was close to ending this weight loss fasting effort. I had to leave the room and go off by myself with an apple and tall cup of water. I feel slightly better now - but the hunger pains today have been the strongest. One tool that has helped me go through the rough spots has been chewing sugarless gum. It entertains my mouth and jaw - seems to distract my mind and body from eating. At least a little. But sometimes I chew the gum with such fervor that I end up biting my tongue. I already have done so several times and it is very painful! The leftover sandwiches have been calling me again. I have been very, very tempted to put one in my briefcase so I could eat it in the car on my way home. I made a fresh cup of green tea and put another piece of gum in my mouth. I am OK for this moment. I do, however, feel very restless and irritable. Heck, at one point I even had the urge to grab a half-eaten sandwich left by a nearby colleague and stuff the whole thing in my mouth! The animal instinct in the raw. Throughout the rest of the afternoon of weight loss fasting the hunger pains continued. At this point I am feeling weak and the dizziness is starting to appear. My tongue is covered with a white, sticky substance and I have a very strong metallic taste in my mouth. I know from this that the dregs in my colon and blood stream are coming up. This is perhaps the most uncomfortable part of weight loss fasting. But I need to remind myself that once the fasting detox process is over in a few days, I will reap the rewards by entering the best part of the experience. It is at that point that the hunger pains all but disappear and I will feel better than I have in years - possibly ever. I move on to day 6 of the Fasting Cleansing Diet. Return from Weight Loss Fasting Experience Day 5 to Fasting Journal MAIN. *Visit The Anti-Prevention Nation© EXODUS Fasting Lose Weight Shop for Top Pick fasting for quick weight loss and colon health / Christian fasting books, juicers and extractors, cleansing kits and supplies.